Did you know that pumpkin pie originated when early Americans scooped out thick-walled pumpkins, filled them with milk, spices and honey, and baked them slowly in the ashes of a fire? I don’t know when I fell in love with pumpkins, those colorful globes, bright and round as beach balls. Maybe it was as a toddler, when I wrapped my arms around the biggest one I could lift, or at the first squish of fistfuls of seeds and goop as I scooped out the insides for a jack-o-lantern. It may have been the finished product with the magic of a twinkling candle lighting the eyes of a spooky creation. Most likely, it was love from the first taste of pumpkin pie, sweet and custardy,mildly nutty, sprinkled with cinnamon, shoveled into my mouth by my mom, the master pie-maker of all time. Pies in my neck of the woods, Pennsylvania, were not made from bland-tasting Halloween pumpkins, which my grandmother called cow pumpkins. Pies were made from gooseneck pumpkins, tan, crook-necked, like oversized birdhouse gourds—squash. All pumpkins are squash. They all belong to the family Cucurbita. After Columbus brought some seed from Central America to Europe, the English called them “pompions.” American colonists changed the name to pumpkin. 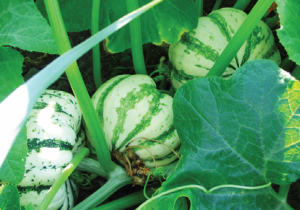 There are so many varieties today that they number in the hundreds, which posed a real problem when I pored over catalogs to choose the seeds for Nana’s Pumpkin Patch. The patch is not just mine. It belongs to my daughter and son-in-law, who bought land near Ida and christened it the McMeen Nut Farm. They dream of pecans, blackberries and sustainable gardens in the not-too-distant future. Meanwhile, I’m growing pumpkins and dreaming of pumpkin fudge, pumpkin muffins, pumpkin stew, pumpkin soup, pumpkin coffee, pumpkin seeds with garlic salt…. I’d better stop, or my name will be Bubba, not Nana. Did I mention that last year, Relish Magazine featured a Rouge vif d’Etampes pumpkin filled with French Pumpkin Soup? Yum! The Rouge vif d’Etampes, which loosely translated means stamped with red, is a French heritage pumpkin. It has stunning burnt-red-orange skin and distinctive ribs. 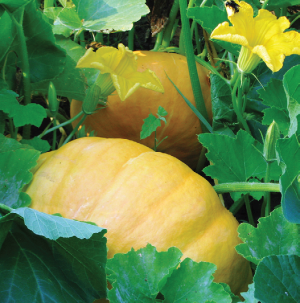 These spectacular pumpkins grow as large as 40 pounds, and take 110 to 150 days to mature. The Fairy Godmother probably picked this type of pumpkin for Cinderella’s magic coach. My son-in-law prepared the one-third acre site. My daughter and I fertilized it with a rotary lawn spreader, pushing back and forth over the bumpy soil. Then we fastened strings to sticks and stretched them across the field, marking the rows. I armed the granddaughters with sticks and told them to poke three or four one-inch holes in the ground every four feet and stick a seed in each hole. Each granddaughter managed to plant one row and then evaporated in the morning sun. Even so, we planted 14 rows of Cinderellas, Small Sugars (great for pies and little jack-o-lanterns), and Howdens, traditional pumpkins for Halloween. I got up early the next morning to finish planting the rest of the patch: several rows of mini-squash, green and white Sweet Dumplings and darkgreen Buttercups that won the taste test at Seeds of Change farms in Española, New Mexico. Mini Sweet Dumplings have a delicious flavor. Exciting? Yes. But that’s not what really popped me out of bed at the crack of dawn. No. That was reserved for the Indian heritage squashes.Ages old varieties given up for lost, suddenly rediscovered: the Lakota, orange with deep green stripes, the Hopi, big, dark orange, and Texas Indian Moschata. I took extra care with them, getting the right depth of seed and spacing. I’d like to say that my master gardener’s sixth sense was tuned to the weather. I have one of my neighbors buffaloed into believing that. But I know it was just dumb luck, or beginner’s luck or the luck o’ the Irish. As I neared the end of the planting, there was a rumble of thunder and the sky got dark. I finished the last two rows in light rain and almost made it to my car before the big dipper in the sky dumped an inch and three-quarters of rain on my pumpkins. So far, with sprinklers and a series of soaker hoses, we’ve managed to keep the plants watered. Vines cover the field—even though we thinned out half the new plants—in some places too thick to walk through. Sweet-smelling, yellow flowers buzz with visiting bees, and pumpkins plump at the end of female flowers. Nana’s Pumpkin Patch has pumpkins! Lots and lots of pumpkins. Halfway between Denison and Sherman was Tanyard Springs, an area heavily wooded with elms, oaks and hickories and containing a flowing spring. It became a recreational destination to lure paying customers onto his interurban railway, the first in the state of Texas. Steel holds the world together, and around the world, steel detailers—the designers who develop the drawings for most things constructed of steel—are held together by a website created, developed, and maintained in a suburban neighborhood in Denison. Randy Sedlacek began the precursor of Steel-Link.com in 1995.